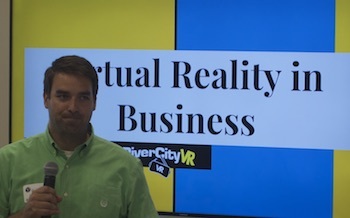 Business Meets Virtual Reality: What’s In Store? There’s no denying it. Technology, business applications and “reality” are melding together in exciting and fascinating ways. The virtual and augmented reality technology of today is helping us create better products and enhanced work experiences. It’s making us better designers, trainers and consumers. It’s even being used in the medical sector to treat phobias and prepare patients for surgery. Virtual Versus Augmented: What’s the Difference? Companies like Adidas, IKEA and Lowe’s are embracing augmented virtual experiences to create meaningful customer interactions – overlaying product options over customer photos to enhance the buying experience. Law enforcement agencies are using VR to re-create crime scenes and walk police officers through stressful training exercises without risk to their staff or the public, reports Newton. Imagine, as a business owner, having the ability to train your employees on complex or potentially dangerous procedures with little cost or risk. Or, if you’re like Kevin McNulty, president of LifeStyle Home Builders, imagine avoiding weeks of time delays and labor expenses on home builds while enhancing the customer experience. McNulty, a VACEOs member, has been rendering traditional 2-D design drawings in a 3-D VR format for about a year. 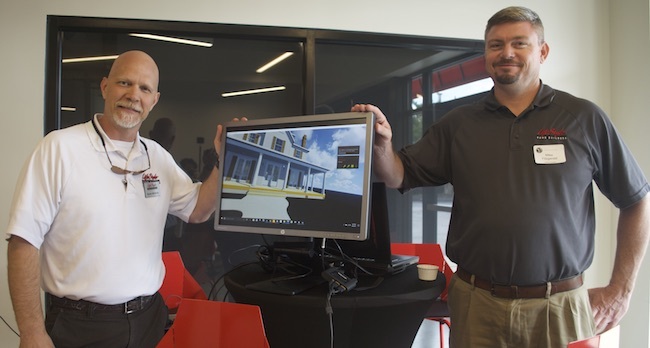 Member Kevin McNulty with Mike Fitzgerald of LifeStyle Home Builders demonstrate their virtual reality application. Customers gain a great sense of spatial awareness during the virtual walk-through, which can take them wherever they choose to go – from outside the home to any room within – through bathrooms, the kitchen, closets and even the roof. After the tour, they may sometimes wish to alter a window or wall – which isn’t a big deal in the early stages of the game. “Reaction to the VR system has been extremely positive,” says McNulty. 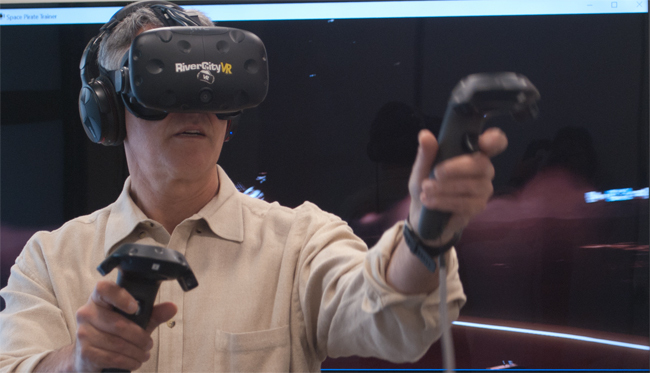 Many manufacturing companies, like automotive giant Ford, are embracing virtual experiences to streamline equipment training. The reward can be higher employee retention rates, lower safety risks, fewer accidents and advanced training opportunities. 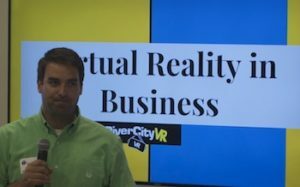 Why Use VR for Industrial Safety Training? Newton reports that in the very near future, VR headsets, phones, glasses and contacts will evolve to become our personal portals into the expanding virtual world. Many of us will begin to participate in Microsoft’s “mixed reality” vision – one in which holographs are used to pin virtual objects to physical spots in space. “Windows is going to push for that, and it’s going to become a natural thing for us to think about virtual reality and augmented reality during our computing day to day,” he says. In the very near future, he added, some of us will experience virtual collaborations with virtual employees on virtual products. Is your company embracing VR technology? We’d love to hear about it! VACEOs members explore virtual reality.